Illustrated by J.R.R. Tolkien with a hobbit map and a map of Middle Earth by Pauline Baynes and a photograph of Tolkien by John Wyatt. Ballantine books, New York, 1972. Boxed. [13 x 12.25 in.]. Illustrated by J.R.R. Tolkien with a map of Middle Earth by Pauline Baynes and a photograph of Tolkien on the cover by Billett Potter. George Allen & Unwin, London, 1973. Boxed. [12.375 x 13in.]. Illustrated by J.R.R. Tolkien with a hobbit map and a map of Middle Earth by Pauline Baynes and a photograph of Tolkien by John Wyatt. Ballantine books, New York, 1973. Boxed. [13 x 12.25 in.]. 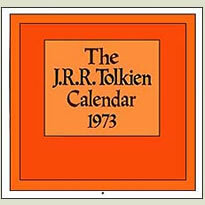 Except the accent coulour change to purple, and addition of Middle-earth dates, this is the same calendar as the 1973 Ballantine calendar. Contains artwork by Tim Kirk. Ballantine books, New York, 1974. Boxed. [13 x 12.25 in.]. There is a small picture of Smaug inset on the cover. Contains artwork by the Brothers Hildebrandt and the back cover has a photograph of J.R.R. Tolkien against a white background. Ballantine books, New York, 1974. Boxed. [13 x 12.25 in.]. 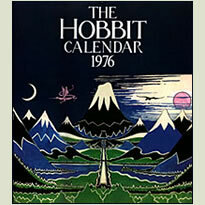 The Hobbit Calendar. Illustrated by J.R.R. Tolkien. 5 Illustrations coloured by H.E.Riddett. George Allen & Unwin, London, 1975. Contains artwork by the Brothers Hildebrandt. Ballantine books, New York, 1976. Boxed. [13 x 12.25 in.]. 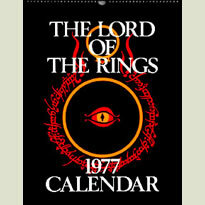 The Lord of the Rings Calendar. The artwork was by J.R.R. 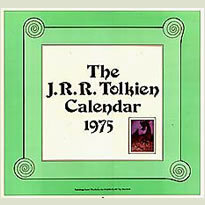 Tolkien as is the emblem on the cover. 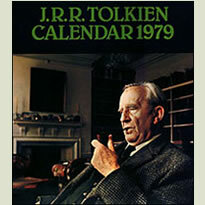 This calendar features notes by Christopher Tolkien. George Allen & Unwin, London, 1976. Boxed. Contains artwork by the Brothers Hildebrandt. 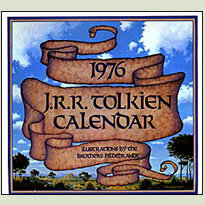 This calendar contains a different set of artwork than the 1977 calendar. Ballantine books, New York, 1977. Boxed. [13 x 12.25 in.]. 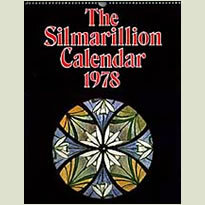 The Silmarillion Calendar. The artwork is by J.R.R. Tolkien as is the heraldic device of Luthien Tinuviel on the cover. It includes a Silmarillion map by Christopher Tolkien. 4 Illustrations coloured by H.E.Riddett. George Allen & Unwin, London, 1977. Boxed. [11 7/8 x 15 1/8 in.]. 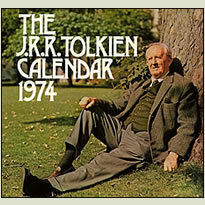 The Hobbit Desk Calendar. Contains artwork by J.R.R.Tolkien. 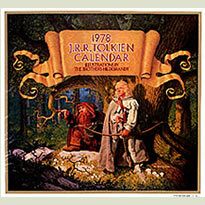 This is an engagemant calendar that contains the same artwork as the 1976 Allen & Unwin Hobbit Calendar. Ballantine books, New York, 1977. [6.5 x 9in.]. 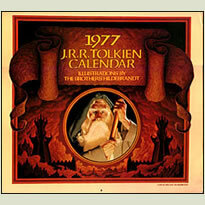 The Lord of the Rings: A Film Calendar. This calendar is the first to contain artwork from the animated movie directed by Ralph Bakshi. Ballantine books, New York, 1978. Boxed. [13 x 12.25in.]. The Silmarillion Calendar. The artwork is by J.R.R. Tolkien and the cover photo by Billet Potter. It includes notes by Christopher Tolkien. 2 Illustrations coloured by H.E.Riddett. George Allen & Unwin, London, 1978. Boxed. [11 7/8 x 15 1/8 in.]. The Silmarillion Desk Calendar. 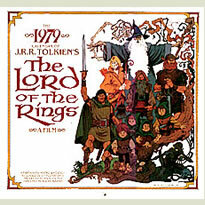 Contains artwork by J.R.R.Tolkien. This is an engagemant calendar that contains the same artwork as the 1978 Allen & Unwin Silmarillion Calendar. Ballantine books, New York, 1978. [6.5 x 9in. ].